Cherish Each Precious Day: Exciting News! I am now a proud member of the Scor-Pal Design Team! Each month, there is a new challenge on the Scor-Pal blog. This month, the challenge is "More than one Fold" with a focus on interactive projects. flip, flap, or pop up! Oh this is just adorable - (how did you do that). Congrats on your new DT position, what a fun position this will be and the Queen of Boxes (you) will be a great addition to the team. Huge congrats!!!!!!!! I loveeeeeeeeee this! That is awesome!!!!!!!!!!!!!!! Congrats on your new position! Great card, I love the bear, it is perfect for this type card. I also love the sentiment. Congrats Patti! 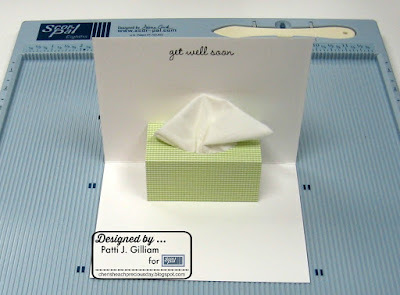 This is so adorable, darling image and how cute is that Kleenex box on the inside. I see a great project for our next group get together. Your card is so cute and adorable. I just love that Kleenix box on the inside of it. And, a big congratulations on your new design team gig! You will do a great job for Scor Pal. I know that is a tool I used for every card I make. Congrats on the new design team. Oh, this card is so cute. Fabulous card, Patti! And huge congrats to you on your new "assignment!" Congratulations Patti! Whoot! I love that pop up fold. Love it. Super cute front. Sweetie card. CONGRATULATIONS, my super talented friend!!!! Love your 3-D creations and they are so fortunate to have you on their team! HI Pattie - it has been awhile since I made one of these - time to do it again - thanks for the inspiration - lovely! Sandy, the stamps are made by Great Impressions - I think they are adorable!!! Congratulations! What a great card! Congratulations. So well deserved my friend. Your work is stellar and noticed by others. This is a very cute project. That tissue box is a hoot. Cute card! But....HOORAY! Love scar-pal! Love your project. so very happy for you! oh my! This is so super cute! I love it Patti and congratulations! Congrats Patti!!! You will have so much fun! Super cute! Love the sweet bear. Great coloring.